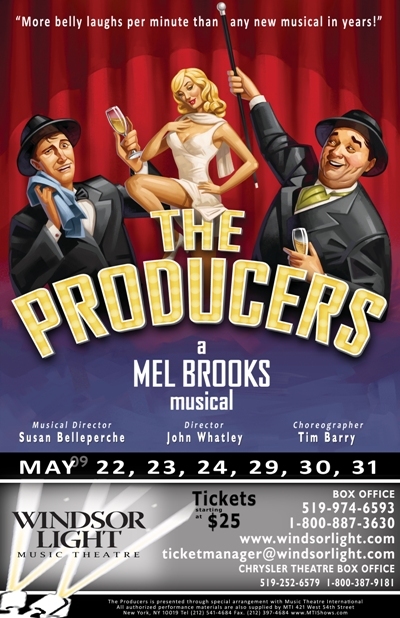 Windsor Light Music Theatre is putting on 'The Producers' from May 22-24, 27-29, 2009. Last night, Jill and I went to the opening night of the Windsor Light Music Theatre‘s ‘The Producers’. Let me tell you this was probably the best performance/show I have ever seen from a Windsor theatre group. The show is taking place at the Chrysler Theatre in Downtown Windsor. There is some strong language and suggestive dialogue, so it may not be suitable for the young ones. So go out, watch the show, walk to a local dining establishment after and enjoy some great food while talking about how incredible the show was.